There’s a new chief behind the counter and what was old is new again in downtown Picton. 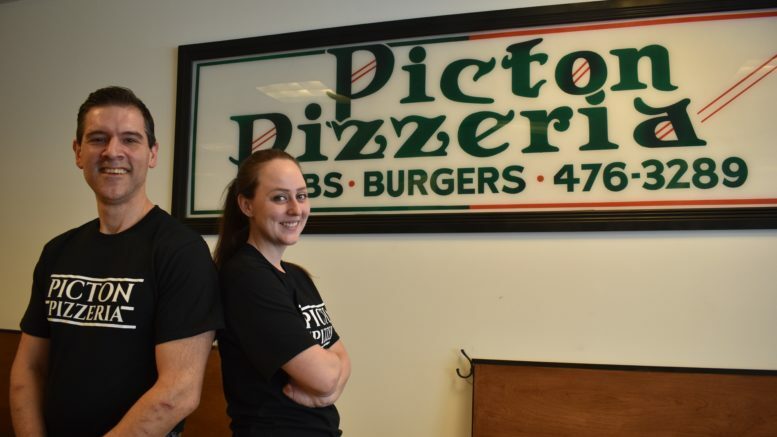 Call it a rebirth, call it Picton Pizzeria 2.0 but whatever you do, if you like pizza made in the traditional Montreal style, just call Andrew Stellatos and Megan Hutton at the familiar spot. Familiar to those of us that can remember wandering into the Picton Pizzeria in the mid-1980’s long before a major franchise restaurant ever dreamed of setting up a location in Prince Edward County, the engaged couple have brought Picton Pizzeria back to life at its original location at the corner of Main and Bowery streets. Angelo Stellatos opened the original restaurant in Nov. 1980 and spent about two decades in the location before transitioning to a larger, sit-down family dining room style restaurant a kilometre or two west on Main st. called Angelo’s in the late 1990’s. After another two decades or so and Stellatos and Hutton have returned the family business to a familiar haunt much to the delight of valued customers and those in the crowd that appreciate the nuanced way in which Picton Pizzeria feels like it never left. Stellatos feels exactly that way as he flips some dough on a snowy Tuesday afternoon. “We spent 20 years here, we were 20 years down the street, hopefully we will be back here for another 20 years,” he said with a laugh. The renaissance of the pizzeria at its former location wasn’t really anything Stellatos or Hutton had planned. With his parents looking to retire and exit the business, the operation was scaled down to a take out restaurant and it was eventually arrived at that Andrew would take over the family business. “We honestly had no intention of doing this and coming back here. No conscious intent at all. But we looked at it and looked at each other and we said can’t pass this up,” he added. And those of us who grew up on Picton Pizzeria pizza from the old (or new, depending on your point of view) location feel as though time has reversed in some sort of magical and delicious way. “The wierd thing is that it feels like we never left and we’ve been here for years,” he added. After preparations were undertaken and the restaurant was refashioned with the original concept but with a more modern tract, it was finally opened in mid-December. Running out of dough was an unfortunate but regular occurrence as Picton Pizzaeria tried to gauge its impact and budget accrodingly. Even staffing compliments needed to be built up drastically as the demand immeidately out wieghed supply. And it’s not only friends or valued customers that have returned to say hello. Or even lend a hand. In the first week of renewed operations, former employee Mark Graham stopped by with his daughter Alice to see the recreation of the site of one of his first places of employment. Long time friends that hadn’t darkened the doorstep of the restaurant since the old days popped by including a person from Halifax who was travelling on the 401, heard Picton Pizzeria had reopened at its former location and simply had to make a detour in order to dive into a pie. Tokens of appreciation and nostalgia have appeared and humbled Stellatos in a emotional sense. ‘One day a cardboard package arrived that I wasn’t expecting and I opened it up and I had to compose myself pretty quickly. 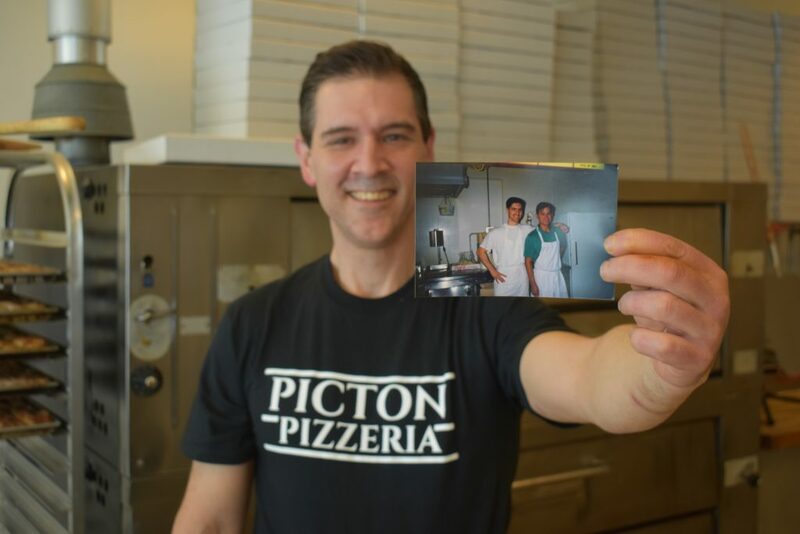 Rob Chu, a boyhood friend of Stellatos and whose family owned the Golden Inn at the same time Picton Pizzeria was in its first hey day, sent a number of black Picton Pizzeria t shirts for the staff. “I’m trying so hard not to break down. He sends me these right out of the blue and I’m totally in awe,” said Stellatos. The redesigned eatery complete with artifacts, pizza peels, photographs and newspaper clippings on the wall have been well received by so many customers. Even the green, white and red sign that was installed over top of the original restaurant in 1984 is a fixture inside the renovated establishment. Stellatos said many visitors have told him walking into Picton Pizzeria feels like a homecoming and, for him, flipping dough and baking pizzas doesn’t even feel like a job right now. “I didn’t realize it meant so much to so many people. It always meant so much to me and my brothers and my family but everyday someone is coming in and making a comment about how great it is to see us back here. Stellatos told him to check again and hanging on the back wall was a picture of Ivan, arm-in-arm with his dear friend the late Terry Hineman in a team photo of the old Picton Pizza hockey team. “He’d never seen the photo and we both had a moment,” Stellatos said. Son Andrew regretfully reports that Angelo can’t quite comprehend the business has returned to its roots where his father first laid his hands in the dough. Angelo spends his days at HJ McFarland Home where, when he has a good day, he motors around the dining room and asks fellow residents and staff about their orders and if the service is ok and if the food was tasty. “He liked it up at Angelo’s for sure but I know he missed the interaction with the guests he was able to have at this location. Socially, he missed meeting with everyone and talking with them so he did miss this location for sure,” Andrew added. Like so many Greek immigrants who value and understood the bond of family, that trait has been ingrained in future generations. Stellatos has also picked up a new to him but re-used nickname.